New Delhi: India and Pakistan will hold a meeting of their foreign ministers on the sidelines of the UN General Assembly this month, the external affairs ministry said, indicating that New Delhi is open to improving ties under a new leadership in Islamabad. This is in sharp contrast to India’s stand of holding talks only after cross-border terrorism from Pakistan stops. India has maintained that talks and terror do not go hand in hand. Several incidents of cross-border terrorism have taken place in the last few days, including the barbaric murder of an Indian border guard along the international border in Jammu on Wednesday. 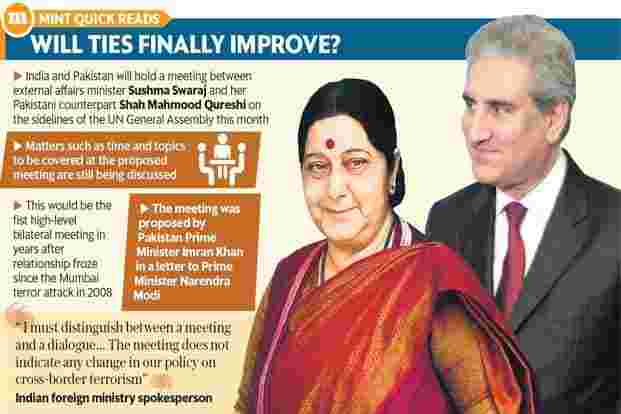 Details of the proposed meeting between external affairs minister Sushma Swaraj and her Pakistani counterpart Shah Mahmood Qureshi, including the topics that are to be discussed are being worked out, said a spokesperson for the external affairs ministry. “Talks are on to identify the topics of discussion during the meeting," said the spokesperson. This would be the fist high-level bilateral meeting in years after a freeze in ties since the Mumbai terror attacks in 2008 in which 166 people were killed by Pakistan-based militants. India accepted the suggestion of Pakistan Prime Minister Imran Khan, who had written to Prime Minister Narendra Modi that the foreign ministers of the two countries could meet in New York to try and break an impasse in ties. One of the issues that will come up during the discussions is India’s demand for Pakistan to open up the Kartarpur Sahib gurdwara corridor for Sikh pilgrims from the Indian state of Punjab. Cricketer-turned politician Navjot Singh Sidhu had recently flagged this issue to Swaraj, said the spokesperson. The announcement of a ministerial level meeting comes in the wake of strained relations between the two countries. The death of the Indian border guard on Wednesday in Jammu provoked outrage, with India accusing Pakistani forces of mutilating his corpse. “It was a barbaric incident that defies logic and civilized behaviour. We will take it up with Pakistan in an appropriate manner," said the external affairs ministry spokesperson. With India heading for national polls early next year, expectations from any bilateral talks are not high. In his letter to Modi, Imran Khan had expressed openness to discuss the issue of terrorism. India has been maintaining that it desires normal neighbourly ties with Islamabad but any meaningful discussion can be held only in a climate free of terror, hostility and violence. “Continued cross-border terrorism from Pakistan remains a core concern for us. Pakistan has been asked to take effective actions to end terrorism and dismantle terrorist sanctuaries and infrastructure on the territory under its control. Until such time, India will continue to take firm and decisive steps to respond to cross-border terrorism," minister of state for external affairs V.K. Singh told Parliament in August. “This is just a meeting, too much should not be read into the proposed meeting," said the external affairs ministry spokesperson. The official sought to distinguish between a meeting and a dialogue, implying that a lot of ground needs to be covered if India is to participate in the Saarc meet that Islamabad will host this year. “Time and again we have said atmosphere in the region is not conducive for a summit. A lot of other countries in the region too have felt that under the shadow of terrorism and cross-border terrorism, Saarc summit cannot happen. Now we have agreed to do the meeting (between foreign ministers). Permanent missions of both the countries will discuss on how and when the meeting will happen," said the spokesperson. India’s bilateral trade with Pakistan is minuscule as a share of India’s total trade. Although India has granted the most favoured nation (MFN) status to Pakistan under the World Trade Organisation rules, Islamabad is yet to reciprocate. As part of trust-building measures, India and Pakistan have opened trade across the line of control since 2008 between Jammu & Kashmir and Pakistan-occupied Kashmir on 21 items on zero duty basis. The transaction is allowed four days per week since 2011, increasing it from two days per week previously.